"A Flower to Die By"
Step into the world of a Boston florist, where greed, lust, anger and beauty meet on a daily basis. At Exotic Flowers in Boston, we value the arts and literature. We are all about creating. 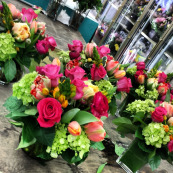 Our mission is to enhance the lives of everyone who has any contact or interest in our florist. You will be on the edge of your seat to find the killer of this murder mystery. At sixteen pages, you will be asking yourself why this is not a movie.